1) I liked how the jerseys were stripped of names, and numbers were somewhat “randomly” assigned. The message is something I loved doing when I coached: every spot is up for grabs, no one is assured anything. 2) Jurgen is channeling some Pia. His comments at half time with Rob Stone, and post match, all focused on the positive. One of the things that came out about Pia during WWC2011 was her philosophy of 80/20 positive/negative. Seems Jurgen, at least initially, is taking that tact. Whether that stays, who knows. I never saw a Bob Bradley halftime speech, but I suspect it was FAR less than 80/20 positive. 3) DON’T get too excited about that 2nd half. No Rafa Marquez made a HUGE difference on the Mexican defensive organization. Clearly they need to find a successor to him between now and 2014, but I was quite surprised by how much his substitution hurt. Similarly, Sinha’s absence was noticeable, as noted on air Gio Dos Santos plays only one speed (fast) and one direction (forward). Being unable to slow down the game when the tide turned in favor of the US and hurt Mexico. And Sinha is 35, so I doubt he will make WC2014 (and maybe not even the Confed Cup). That replacement is going to be as key as Marquez. And of course, there was no Chicharrito. 3) Torres and Landon need to be central–they were much more effective centrally, even accounting for what I said above. We’ve seen this time and again not only with Landon, but Clint Dempsey. I suspect that Jurgen will give Landon and Clint more latitude (and NOT isolate them on the flanks) as Bradley did, but that will clearly depend on situational/tactical needs. IF Torres finds a home on the USMNT, it will be central not on the wing which leads to…..
4) We’ve got LOTS of central MF players–aside from those we saw last night (Beckerman, Bradley, Rogers, Jones, Shea, Clark, Torres, Donovan), include Edu, Clint (at times), and soon Stewart Holden (a personal favorite). How Jurgen maximizes this talent will be interesting. Jones probably played himself out (at least in my eyes) and I’m not sure I would pick Edu over some of the younger guys, and Ricardo Clark seems to be enigmatic. 5) We can’t play the solo striker. Look, Buddle, Aguadelo, Altidore, Davies, these are forwards in the US pool. They need partners. In part this is due to the fact that most US club, school, etc squads play with 2. If not playing a 4-4-2, if you’re going to play a 4-5-1 (and just on a personal note, the lineup was shown on telecast with 4-2-3-1, but COME ON, it’s 5 MF, with two holding why do we have to fancy it up?) the 1 or 2 attacking mids REALLY have to play close to the lone striker to get good combo play. Brian McBride ain’t walking back on the pitch anytime soon, and he was the best target forward ever in the US (and among the best globally in his prime–that’s a nod to Jon Novy), so MAYBE we shouldn’t try and force our forwards to play that way. 6) The search for a new back line continues. By far, last night it was the “old men” that shone–Bocanegra and Cherundolo. Orozco Fiscal and Castillo didn’t do it for me. That might just be because it’s early, but I’m not sold on either. And mind you, this was a Mexican squad without Chicharito. The Costa Rica and Belgium friendlies will hopefully shed some more light on that situation. My concern with Klinsmann is exactly the one lots of commentators have already cited–he’s not really a tactician, and it was Jogi Löw who did all that heavy lifting with the German National Team. And Martin Vasquez, who went from being an assistant at MLS’s Chivas club to being Klinsmann’s assistant at Bayern (and came back for a short tenure as Chivas’s head coach), isn’t really a tactician either–but he seems to impress folks since he got the Youth Development Director position with Real Salt Lake post-Chivas. I like Dooley as a possible assistant. He would seem to bridge some of the American/German dynamics. And Tab Ramos is still in my eyes the best player ever to wear the shield (sorry to the Claudio Reyna and Landon Donovan fans), and I think he has high potential as a coach. This might be an audition for him with the u20s or 23s since he’s the interim there. I think it would make sense to have Claudio as the new technical director to be on the staff in some capacity. But having a big-time tactician on board is key. To make a cross-sport analogy, Phil Jackson was always the big picture, motivation, keeping the team in balance guy, while he let Tex Winters install and run the offense in the Triangle. I think that’s the dynamic (at least that’s the word coming out of Germany after the hire, and also previously during the multiple Gulati-Klinsmann flirtations). So the question for me becomes: is there a dynamic tactician somewhere in the ranks of USMNT youth squads, or MLS, or elsewhere. Sadly this person will probably have to come from his old German contacts. In terms of who I would like to see him bring in–there’s Peter Nowak. Now this might be my Chicago Fire bias, but he’s a former international for Poland, and has worked in both MLS and the US youth systems. I realize that as a former Bradley assistant he might be fraught with baggage, but I think he might add some “bite” that complements Klinsmann. Other guys I think would be interesting as assistants are Dom Kinnear and Franky Yallop, who I got to watch and talk to when I was coaching in Nor-Cal when they were with the Quakes (or Dynamos now). 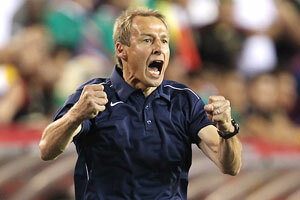 I’m cautiously optomistic on Klinsmann generally. I don’t think he’ll be the savior that some think he will be, in part because of the need to change soccer culture vis-a-vis player development, which will be a long time coming. Finally, on a player selection note, I’d like to see him bring in (Stanford Bias Warning!) Chad Marshall. He had a good run with the U23’s on the back line, played well as a center back for the Columbus Crew last year, and was in the WC2010 camp, so hopefully he can get a longer look. Today, I decided to check out the French newspaper Le Monde to see what was new in the disaster which was the French excursion to South Africa. At the same time I opened my online edition of the NYT to see general reactions to the World Cup. Low and behold I see in both quite a bit. But what was disturbing was the shift in rhetoric from one of technical and tactical abilities, having a lame duck coach, etc. to one of Race, Nationality, French Identity, and Patriotism. The gist of the argument is that problem with the team had nothing to do with the age of players, the lame duck coach, but instead the fact that the team looked like the melting pot of French society, with players from many corners of the former French Empire—Senegal (Evra), Guyana (Malouda), Cong (Mandanda) to a name a few. How could the foreigners, these not true French, be proud to wear Les Bleus. They won’t sing Les Marseillaise! In fact the right-wing philosopher Finkielkraut, as well as right wing politicians, referred to the team as “a gang of thugs” and “black-black-black”, and equated them with the young men of Afro-French and Franco-Middle East descent that engaged in protest and riots that spread throughout France 5 years ago. Never mind that stars of Les Bleus past and present included the likes of Zidane (Alegeria), Thuram (Guadalupe), Viera (Senegal) and other “immigrants”.